***Note: To downloads Fantasy Screen savers from this page, please click on the screen shot of interest. Magical snow falls in this winter wonderland snow globe screensaver, nestled in Christmas garland. A North pole scene including a darling Eskimo and beautiful Northern lights make for beautiful animated scenes. Millions of years ago, our planet was inhabited by dinosaurs of all kinds: brontosaurs, tyrannosaurs, karnotavry, megalosaur and of course the true masters of the skies, pterodactyls. It was an era of enormous sea, land and flying lizards. 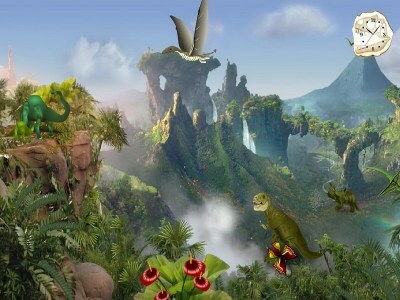 Install this colorful animated screensaver with three scenes to your computer and make a fascinating journey to the lost world. Distant, moving like a time machine, millions of years ago. The magnificent green valley with waterfalls and lush vegetation, various types of dinosaurs, prehistoric volcano, and of course, flying monsters, will not leave you indifferent. And will bring you a lot of positive emotions and impressions. The depths of the Caribbean Sea are fraught with a lot of unsolved mysteries. There are treasures from sunken pirate ships - galleons, schooners, brigs. Countless expeditions went in search of them, but not all of them had been successful. The seas and oceans are stored with it is great treasures of sunken ships, as well as the many mysteries of the ancient times. Take a fascinating underwater journey to the mysterious depths of the Caribbean Sea. 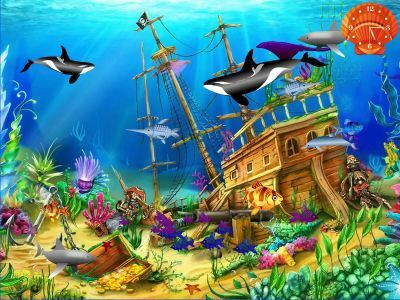 The magnificent underwater scenery in the background of a sunken pirate galleon, sea creatures, tropical fish, dolphins, killer whales, jellyfish, starfish, stingrays, sharks undoubtedly decorate your monitor and raise your spirits. Install our new pirates screensaver on your computer absolutely free! 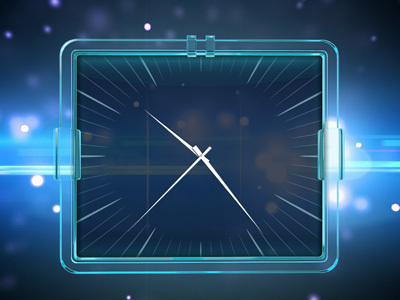 The original screensaver "Dream Clock" with an abstract relaxing background allows you to relax during a break. Nice animated background and classic analog clock. But in addition, you can always keep track of time so do not miss important things to do! Screensaver is suitable for any screen resolution and any Windows version. Download free dream screensaver! What citizen has not dreamed at least once in their lives to escape from the hustle and bustle of the stunning city life to nature in one of the many villages, so there, in your home or cottage in the village of leisurely drink this, liquid milk, to please your stomach really natural cream and sour cream, fresh fruit and vegetables? And how romantic to spend the night with my girlfriend in the woods in a tent with her to meet a beautiful dawn of the sun! Or how great lie together at night to warm the Slavic land and watch the twinkling stars! Little children - expanse: you can spend hours swinging on a swing, play in voynushki and worn in the ravines, explore the area, walk through the fields, gather strawberries, cherries, apricots, apples, watermelons, swimming, picking mushrooms, herbs ... But, alas, for most of our people dream of buying a house in the village or the village and remains one of the many unfulfilled dreams in life. And for good reason. Soul - in fact it an integral part of human life, we must take care of her, she had to give solace, respite and inspiration. And all this can give a modern man and his mind straight and direct contact with nature. 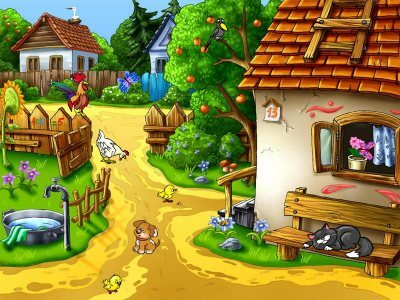 Check out this great animated screensaver with the village you will be pleased. It is very easy to download and install! 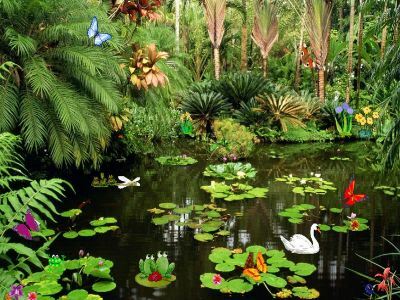 Enjoy a lovely summer ponds with beautiful animated butterflies, fluttering above them. In this free butterflies screensaver you will find not only the colorful butterflies and other inhabitants of the fauna, eagles, birds, insects, fish jumping out of water and pets. And of course, every pond should have it is own frogs! Funny green inhabitants of ponds and reservoirs are also presented in the scenes of this wonderful screensaver. Download and install free butterflies screensaver! It will undoubtedly give your desktop a unique flavor of our favorite season. We present you new realistic underwater world screensaver. 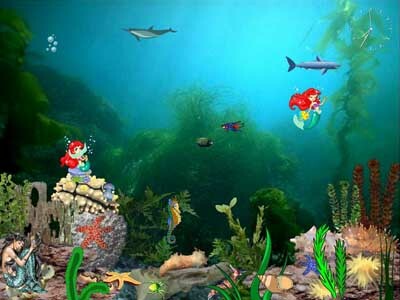 Transform your PC desktop into wonderful underwater kingdom of mermaids with living tropical fishes, dolphins, sharks, whales, seahorses and other sea creatures. Enjoy looking aqua life with smooth animation and coral reefs background. Deep into ocean with mermaids kingdom screensaver. You will also like realistic sea sounds with three scenes. Analog clock at the corner of each scene will surely impress you! We hope this screensaver will encourage you to buy a home aquarium. Download and install free animated screensaver! 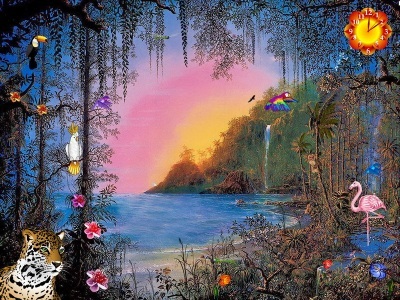 Paradise Sunset Screensaver will transform your desktop into fantastic tropical island with waterfalls, lagoon and it is inhabitants. Tropical sunset is very impressive scene. Here you will find gulls, parrots, flamingo and other tropical birds. Funny animals like monkey climbing on the trunk of a palm, leopard, exotic plants and flowers will not leave you indifferent. Make a little journey to the tropical islands! Download free sunset screensaver! Do you remember square mechanical clock with arabic numerals? Now you can enjoy this clock on your desktop with our new clock screensaver. It is designed in blue and grey colors and will really save your screen. Besides we offer you very interesting animation at background and some options. Do not hurry, feel the time! 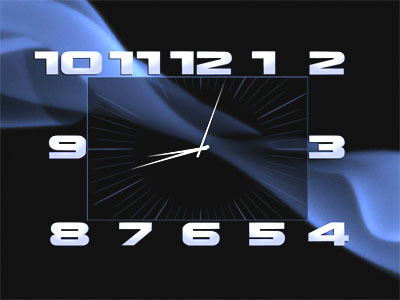 Download free clock screensaver. If you are a "Fantasy Screen savers" creator and would like to have your work listed on DesktopLand.com then please submit your work for us to review and list. Exotic, tropical life 3D fish and coral reef. Nice aquarium music and 3D bubbles. Multiple Varieties of fish & sea life. Friends and Fantasy Screen savers Developers - Welcome! © 2000-2015 DesktopLand.com. All Rights Reserved. All images on DesktopLand are copyrighted by authors. Pictures can only be free downloaded for personal use only.